We’ve looked at the history of the development of this building last year. It’s half of two structure with an identical design and different architects. This is the 1904 building designed by William Blackmore for Elizabeth Rogers although he didn’t have to do a lot as it’s a copy of the 1901 building to the west designed by Parr and Fee. This closer shot shows the stonework on this building doesn’t exactly match the construction of the older building. 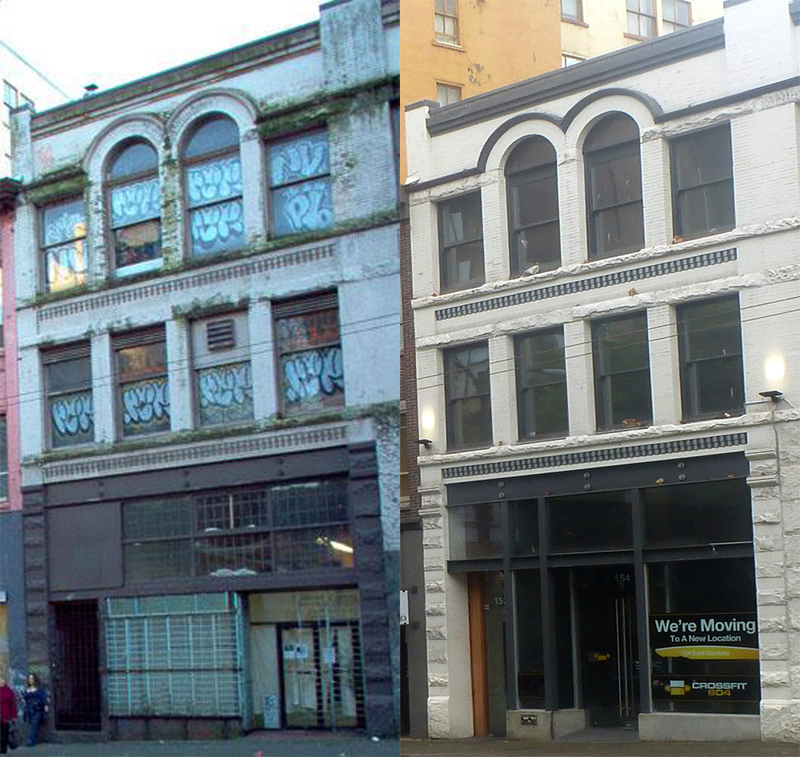 This 2004 image shows the condition of the building ten years ago, before new owners restored the building and introduced office uses to the upper floors, replacing a variety of arts and music groups who paid low rents in the run-down space. Concerns about fire safety eventually led the City to close the building, which in turn led to the sale and restoration of the property. We weren’t able to exactly match the angle the older picture was taken, as we weren’t willing to stand in the middle of West Hastings to replicate the perspective of the adjacent building! Today this is called ‘Le Guernsey’ and it’s an apartment building on Thurlow Street on the corner with Haro. It was built in 1912, although there was a house built here in 1896 initially occupied by M T Quisley, the assistant chief operator for the C P Railway. It started life with 20 units, but over the years they’ve been reconfigured to 34. A J Bird was the architect for owner Peter Agren, although the Permit (for $125,000) suggested Agren himself designed it. An earlier 1909 permit that wasn’t pursued would have only cost $50,000. When it was built it was called Victoria Court, and later it became known as Bush Manor, although not until some time after this 1935 Vancouver Public Library photo. Peter Agren was a contractor, so he almost certainly did build the apartments. He has a number of other permits for houses that he designed, including two still standing today in the Mole Hill development. He was a Swede, and in 1911 he was lodging with Charles and Hilda Anderson (also Swedish) with Manuel Agren, who was probably his younger brother, a carpenter (and probably really Emanuel). The two appear for the first time in street directories in 1904, although they disappear again until 1908 when they were at 1136 Comox. Charles Anderson was probably either a close friend or a relative, as he was the resident manager of this building later in 1911. The 34 unit building was recently offered for sale for $8.5 million. Next door is the much smaller 1926 ‘Cameron’ apartment building designed by A E Henderson. This is the eastern end of the north side of the 100 block of Water Street – so we’re looking from the corner of Abbott Street, and the picture is dated to 1906. The building closest to us is the Canadian Fairbanks Building at 101 Water Street, designed by E E Blackmore and W T Whiteway for McLennan & McFeely, and completed a year earlier. They only had half the building – the other half was for rent. Next door was the former Methodist chapel which was being used as a flour and feed store by Frederick Allen. The building was replaced in 1923 with the modest 2-storey building still there today, commissioned by Rainsford & Co and designed and built by Dominion Construction. Next door is a two-storey building known as the Lovell Block. The Heritage Statement of Significance for the buildings says it was built in 1888-89, and that it was built “for pioneer Vancouver businessman John Badcock Lovell”. In that respect it’s incorrect: J B Lovell was a Victoria businessman, although he did have a number of Vancouver investments including another Lovell Block in 1900 and the Bodega Hotel. Mr Lovell also bought the site of the Methodist church in September 1888. The construction of his new block, like so many at the time, was fast and not very well done. In December it had to be started again, as the Victoria Colonist piece shows, and it wasn’t completed until 1889. Perhaps the more careful reconstruction is why the building is still standing. 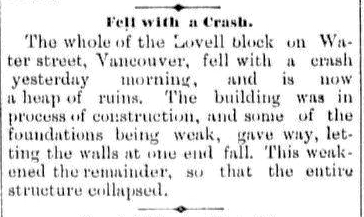 Mr Lovell was born in England in 1831 and had been in BC since 1858. He was a miner, ran the Express at Richfield, a number of trading stores and was Coroner in the Stickeen region in 1874. He managed the Victoria Co-operative Company store, although in 1881 he was listed as a miller, and in 1891 and 1901 as a merchant in Victoria. He married Margaret, 28 years younger, in 1873 and they had three children. He died in 1915, aged 84. Next door was a 3-storey (and basement) building where J Y Griffin & Co wholesaled produce and provisions, managed by Robert Robertson. In 1908 their specialty was packing pork and beef. The building next door was occupied in this picture by F R Stewart, another wholesale produce firm, and Baker, Leeson & Co; wholesale grocers. Two years later Mr Leeson was running his business on his own and moved down the street a bit, and a year after that he had teamed up with two new partners from New Brunswick and built a much bigger warehouse on the next block for Leeson, Dickie Gross & Co. F R Stewart also built new premises after this image was taken at 129 Water St, seen on the edge of our earlier post; designed by Parr and Fee in 1910. Here’s the central part of the north side of the 100 block of Water Street in 1920. In the foreground on the edge of the picture is F R Stewart’s warehouse, designed by Parr and Fee in 1910. Down the street at 141 Water Street is the large 1898 warehouse which the Heritage Statement says was developed as an investment by John Twigge. Major-General Twigge was born in Dublin but was a member of the British army (in the Royal Engineers). He arrived with his brother around 1897, and both invested in property throughout the Lower Mainland, as we noted in an earlier post. There’s no architectural attribution for the warehouse, or the additional two storeys that were built before 1906. It’s possible the Twigges acquired a recently commissioned building rather than acting as developers. In 1898 the Province announced the development of a ‘warehouse for the Estate of Hon. Theo Davies near the W.H. Malkin & Co. warehouse’ designed by C O Wickenden. Malkin’s warehouse was actually in this location, and the two businesses leasing space in 1898 who would both expand and build their own warehouses in a very short time were W H Malkin and Kelly and Douglas. The small building between the two warehouses predated them both; it was built as the Royal Hotel in 1888 by Benjamin Wood. He left England in 1882, followed by his wife and three children, arriving in Victoria before heading to New Westminster where Ben set up in the hotel trade. Hearing about the fire destroying Vancouver, it’s said the he established a soup kitchen for the firefighters (who would be the remaining residents of the newly created city). A year later the family moved to Vancouver: Ben set up shop as a tailor and built the Royal Hotel with 26 rooms, and his wife, Frances, (like Ben, born in Buxton in Derbyshire) as proprietor. He partnered to buy The Stewart House hotel in 1889, but sold it a year later and returned to running the Royal, now renamed the Albion Hotel. In 1891 he was back in New Westminster, as a brewer. In 1894 the Albion was sold at auction and it became the Imperial Hotel in 1898 before being converted to one of the many fruit and vegetable warehouses on the street in 1901. Ben and Frances divorced at some point, and he remarried, but he stayed in the area and was still a tailor when he joined the Pioneer Association in 1923. He was living on Lulu Island when he died in 1933. We’re not really sure about the warehouse closer to us with the arched windows, but it was completed before 1901 and as the Twigge block to the west of the Albion Hotel was built in 1898 it seems likely to be the 1890 ‘commercial block for Mrs. Gold adjoining the Albion Hotel’ designed by E A McCartney. Mrs Gold would presumably be Emma, the wife of Louis Gold, the owner of the Gold House Hotel across the street a block away. Like the Royal Hotel, The Twigge building is still standing today. It was converted to residential uses on the upper floors in 1996 (with two extra floors added behind a setback, designed by Merrick Architects) and called ‘The Malkin’. Both the other buildings were replaced in 1974 by the Henriques and Todd designed ‘Gaslight Square’ for Marathon Realty. In 1900 five rival architects teamed up to produce an illustrated guide to Vancouver – appropriately title ‘Vancouver of Today Architecturally’. One of the partners was G W Grant, who chose to feature The Twigg Block. 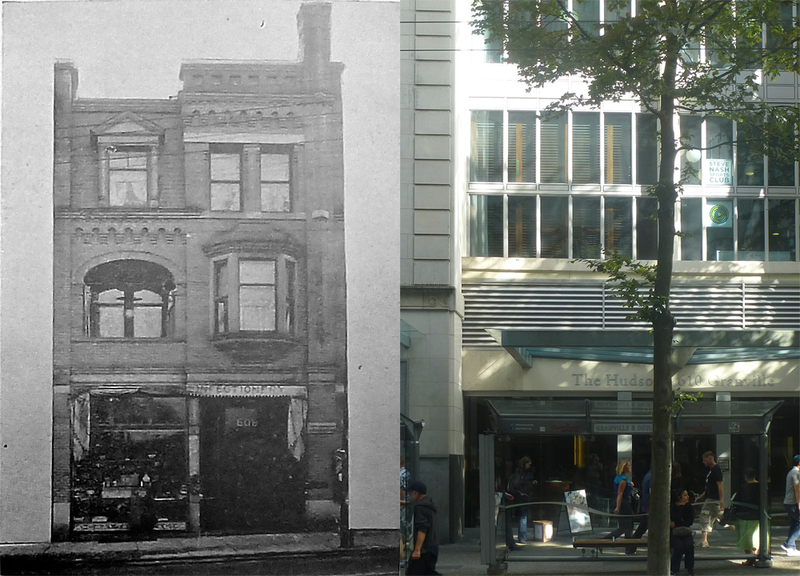 Although the address isn’t identified, the photograph shows it was at #608 and was a confectioner’s, so that narrows the location to E Minchin & Co on Granville Street. 608 Granville was 50 feet south of Dunsmuir, and on the 25 foot lot that was owned by Mr Twigg, G W Grant designed an extraordinary building. Son of a Nova Scotia farmer, Grant initially moved to New Westminster in the 1880s and designed over 100 buildings there before opening a Vancouver office. While the Granville Street building was relatively modest in scale, it looks almost as if it was designed as a 3-D catalogue for all the styles of window available – recessed, bay, pedimented and square. Although they don’t seem to feature in any of the biographies of the day, the Twigg family – or probably more accurately the Twigge family – were both wealthy and active in real estate. Major-General John Twigge and his brother Samuel Knox Twigge, came to Canada in 1887 and to Vancouver before 1890. They were the sons of Captain John Twigge of Dublin. Mrs. S.K. Twigge and her two daughters came in 1891. They lived in a house on Pender Street, jointly owned by the two brothers, and built before 1901. The Major-General, whose title is invariably referenced, is said to have been the developer of a Water Street warehouse in 1898, although his brother, S K Twigge is also often found associated with real estate in the city, and he owned the Granville Street lots. On at least one occasion he picked up a site when unpaid taxes led it to become available at a significant discount. In 1890 John Hill Twigg was recorded buying land from Robert Tatlow (so that’s the Major-General). In 1891 the brothers bought 150 acres of land in Whonnock, where the Canadian Co-operative Society built and operated the Ruskin Mill on a few acres of their property. Samuel Knox Twigge is shown on the assessment and collection records of the period until 1905, when he sold the land. He was also involved in the creation of South Vancouver in 1891, and there’s an island in the Fraser River named Twigg Island (but after a nephew, Conley, who had a dairy farm there). In 1893 S K Twigge and architect R McKay Fripp ended up in court disputing costs on a pair of houses Twigge had commissioned. He lost the case. In 1897 the Board of Trade sent Major General Twigge (late Royal Engineers) to the Third Congress of Chambers of Commerce of the Empire in London. S K Twigge died in 1906, and his widow may have returned to England. His two daughters stayed in British Columbia; Sidney, who married in 1910, moved to a ranch in the Chilcotin, although in the 1920s she moved to England after she was widowed in the First World War. In 1909 she hired Maclure and Fox to add a $3,000 extension to the Pender Street house. Her sister Mary had married in 1896, and died at Alkali Lake in 1934. We hadn’t appreciated that Samuel Twigge so liked W G Grant’s design that he built it again. This extract from a 1900s picture of the block shows that a second building was built to the south which is apparently an almost exact replica of the first. There’s another image of this block in the city Archives that shows both structures were built by 1893. Today the site of the first half of the Twigg Block is the entrance to The Hudson, a 423 unit condo building that was completed in 2006 and designed by Stantec Architecture. The Kenilworth Apartments were photographed around 100 years ago when half the building that’s there today was recently completed. Built in 1910, the building was designed by Grant and Henderson for S S Bond at a cost of $23,000, described as a ‘brick veneer apartment house’. We’re not sure if that covered the cost of the whole structure – which continued along Cardero (and was completed by 1912) or the structure that can be seen in the photograph. Sidney Silas Bond was born in Sheffield, Ontario, married Mary Reid in Toronto in 1908 when he was aged 40 and died in Vancouver in 1952 aged 84, a year after his wife (who at her death was aged 90). It looks as if Sidney was a builder, but also sometimes a lumberman; in 1908 Sidney S Bond applied for a special timber licence to log an area of the city. In the street directory for that year he was described as a builder, and he was living on West 7th Avenue. In the same year he built the Kenilworth Mr Bond had the same architects design a house (presumably for himself) at 1232 Harwood Street. There’s no sign of Sidney in Vancouver before 1908, but his late marriage and apparent wealth may be explained by the location of the only S S Bond in the 1901 Census – the Yukon. Today the Kenilworth is still standing, although the context is dramatically more leafy. We saw the small building just showing on the far left of the picture (the Bank of Nova Scotia) in an earlier post. The three storey building is the Canadian Pacific Telegraph Building, built and operating by 1901. Dalton and Eveleigh are associated with something called ‘The Railway Building’ built in 1903, and the 1903 Insurance map for the city shows foundations for a new building to the west of the telegraph office, so it’s likely to be the two storey structure. There’s another permit for this location in 1913 by Davis & Sanders for the Canadian Pacific Railway who were also listed as the architects. As it’s for $2,300 it’s likely to have been an addition rather than a new building. Davis and Sanders were a competent contractor with previous experience building Ferrara Court on East Hastings. The street directory (and their newspaper advertisements) refers to them as Davies and Sanders, and identifies them as William A Davies and Ernest Sanders, Assuming it’s the same Ernest Sanders, he had previously been a cabinetmaker. Our 1918 VPL image shows CP using both buildings, and also that the Bank of Nova Scotia’s original pediment was replaced quite early in the life of that building. Curiously, no architect has been identified with the design of CP’s Telegraph Office, although it was, and is, a handsome building. The two storey building was rebuilt in the mid 1930s to create a new featureless three storey structure. The two buildings were used by numerous railway and transportation-related companies that maintained offices with representatives or ticket agencies including the Northern Pacific Railway, Great Northern Railway, Alaska Steamship Company, Nippon Yusen Kaisha Steamship Company and the Western Union Telegraph Company.